Are you kidding me? What the heck’s a telomere and why would anybody care. Heck, I’d been a grandpa six times before I ever even heard of a telomere. If it was important to take care of wouldn’t someone have mentioned it before now? Mom and dad made a big deal out of getting plenty of sleep, eating right, and brushing our teeth, but not one mention of taking care of my telomeres – until now! Our body is made up of billions of cells – and between 50 and 70 billion of them of them die and are replaced every single day. Inside the nucleus of each cell, our genes are arranged along twisted, double-stranded molecules of DNA called chromosomes. 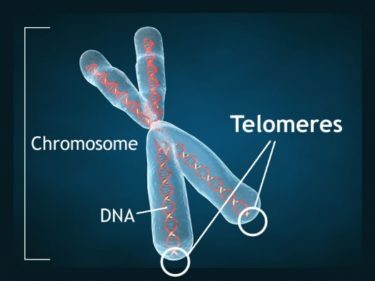 And at the ends of those chromosomes are stretches of DNA called telomeres, which protect our genetic data, make it possible for cells to divide, and hold some of the secrets about how we age. To describe them simply, we can compare telomeres with the plastic tips on our shoelaces. Just like the plastic tip keeps a lace from fraying, telomeres keep the chromosome ends from fraying and sticking to each other. Each time a cell divides, the telomeres get shorter. When they get too short, the cell can no longer divide, and it dies. This process of telomere shortening is directly associated with aging and a higher risk of death. So there you have it gramps (and grandma too). It’s time to strengthen your telomeres.